Terrorism is not an enemy. It is an activity carried out by enemies. Terrorism serves a purpose: the purpose of the enemy who uses it. If one merely targets terrorism and terrorists – as Western leaders are now (weakly or strongly) promising to do in response to the November 13, 2015 murders by proponents of Sharia in France – one is not fighting a war. One is merely cleaning up after a battle. The purpose of the Islamic terrorists is not a secret. Their purpose is to defeat democracy (to eliminate Man-made laws, and the making of laws by Man) and to replace it with theocracy (i.e., Sharia: Allah-made law, enforced by Man). By eliminating all Man-made laws, and ending law-making by Man, government ceases to be the hand of the governed in the service of the governed. You can safely, but loosely think of Sharia as a set of laws akin to the Ten Commandments: Sharia is allegedly god-made law. By replacing Man-made law with Sharia law, and by enforcing Sharia, government becomes the alleged hand of an alleged god (i.e., Allah), in the service of those who believe (or pretend to believe) in the existence and will of Allah. 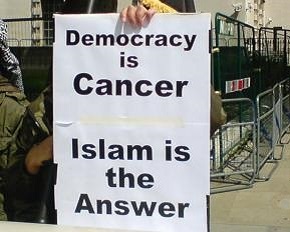 Terrorism is hardly the only means to replace democracy with an Islamic theocracy. Islamic terrorism is simply a strategy whereby people are intimidated into not defending democracy and freedom; intimidated so that they will not fight the imposition of Sharia. Other means exist to defeat democracy, and they currently are being used by far more people than are resorting to terrorism. For example, proponents of Sharia currently are free in most places to run for legislative office, and to form political parties to support pro-Sharia candidates. Others simply advocate Sharia: on TV (e.g., here), in the street (e.g., here), in schools, in mosques, on the Internet (e.g., here) – anywhere. Promise an afterlife of bliss, and some people – desperate or gullible people – will gladly give up freedom and the pursuit of happiness in this life. Still others are practitioners of the tried and true method of playing the racism card. Specifically, they write or call-in to radio stations, TV shows, newspapers or magazines claiming that to identify the religious goal of the terrorists is to somehow be a racist; demanding that such media folk be silenced or removed. The added benefit of this method is that it gets the support of religious people from all religions: fearing that their religious beliefs might be the next to be condemned, many gladly join in the effort to silence anyone in the media who dares to blame murder on religious beliefs of any kind. It follows that the enemy of the West – the enemy of those who seek to defend democracy – is not terrorists alone, but anyone actively sympathetic with the cause of Sharia. Specifically, the enemy is anyone who, if he/she would not face criminal sanctions, would gladly help-out, in some peaceful or violent way, the anti-democratic cause of Sharia. Of course, to advocate Sharia is not merely to advocate the defeat of democracy, but to advocate the defeat of that which democracy is meant to defend: individual freedom. By ensuring the government serves only the governed – and not someone’s alleged god – democracy defends the freedom of every individual to think and choose and not obey the alleged will of an alleged god, especially because it ensures that the governed can make laws to defend their freedom of choice. When Western governments make the advocacy of Sharia illegal – when they arrest and punish for treason those who, in our midst, are calling for an end to democracy and freedom – the West will be defending itself and actually fighting the war that all pro-Sharia individuals violently or non-violently are conducting against us. We at that point will be defending democracy and individual freedom. However, until then, we are all just waving a white flag, mopping up the blood of Westerners, and waiting as self-deluding cowards until we lack the means to defeat the enemy. Finally, to those who will assert that banning Sharia advocacy would be a violation of free speech or free thought, I offer the following example as a lesson in freedom. To make it illegal for you to say, earnestly “I’ll pay you $10,000 to murder Mr. X” is not to infringe your freedom of speech. It is to defend the life of Mr. X. Similarly, to ban advocacy of Sharia is not to violate or infringe freedom of speech or thought, because – just as nobody has the right to take a person’s life without his consent – nobody has the freedom to take away someone’s liberty or property without his consent. Yet that is exactly what Sharia would do. To advocate Sharia is to advocate the obviation of your consent to the taking of your life, liberty, or property. To outlaw advocacy of Sharia is not to violate freedom, but to defend it. Keep in mind, also, that exposing Sharia’s nature is not, itself, advocacy. There is no point in banning information about Sharia, any more than there is any point in banning information against any of the other deadly ideologies that have caused the murders of millions. The wrong that must be fought is not the ideology, but its advocacy. The enemy is not information about an anti-democratic, anti-freedom ideology, but the person who calls for an anti-democratic, anti-freedom ideology to be adopted or enforced. As I’ve asserted in the past: communism did not kill anyone, communists did. I encourage all Western governments to identify Sharia proponents as the enemy, and to make and enforce laws to outlaw the various means currently being used to advance Sharia.